Iatrogenic damage to adjacent tooth following crown preparation was a frequent side effect of this procedure. Long and Smith conducted a study, in which dentists were asked to prepare extracted teeth fixed in the anatomical contact position and found 100% damage to the surfaces of adjacent teeth. They further concluded that preparation of teeth with easier access to the contact area was less prone to cause damage to adjacent teeth. Abdulwahhab et al. conducted a similar study in Saudi dental students and found that nearly 98% of adjacent teeth were proximally injured. They also found that the damage was more frequent in the maxillary teeth, but there was no significant difference between right and left sides. Higher risk of iatrogenic damage to the maxillary and posterior teeth were attributed to more challenging physical and visual accessibility for those teeth. It might be prevented using matrix bands, other teeth separation aiding devices; however, these bands were either not used by most operators or they are ineffective., In fact, the studies had also shown that the use of surgical microscope does not decrease the damage to adjacent tooth surfaces during preparations. However, it helped in the accurate detection and quantification of iatrogenic damage to adjacent tooth. The high percentage of iatrogenic errors during crown preparation had imparted importance on the assessment of undesirable effects that lead toward additional treatment need. Currently, there are limited studies in literature that shows the frequency of nicks and abrasions to the adjacent tooth during crown preparations. Therefore, the current study was carried out with the aim to determine the frequency of different types, degree, and location of iatrogenic damage to the adjacent tooth during crown and bridge preparations in local setting that might lead toward the problematic effects. A prospective study was carried out in Dental Laboratory, Aga Khan University Hospital using dental casts. The sample size was calculated with sample size calculator (sample size determination in Health studies, WHO). The study by Abdulwahhab et al. was taken as a reference that showed iatrogenic damage to 98.2% of proximal tooth surfaces. Keeping the relative precision to 3% and confidence level to 0.99, the sample size turned out to be 136 dental casts. The sample size was inflated to 150 dental casts to compensate for errors. The nonprobability convenience sampling technique was used, in which dental casts of patients with prepared teeth present in the dental laboratory with at least one adjacent tooth were included. All the preparations were carried out by either the postgraduate trainee or the consultant both having experience of more than 3 years after graduation. All casts were examined after removing from the impressions before any manipulation was done, so that any damage to the proximal surface of the adjacent tooth was only associated with the clinical procedures. Cast that showed porosities or damage due to improper handling were excluded from the study. C: Cervical third of the proximal surface. Readings taken from each cast were recorded on a specially designed pro forma, as shown in [Figure 3], in which type of clinician and preparation was filled using the laboratory prescription. Twenty dental casts were randomly selected for evaluation by two investigators. Readings were taken by both the investigators and compared to check the interexaminer reliability. Interexaminer reliability was determined using kappa statistics that showed the perfect agreement. SPSS version 22 was used to analyze the data (SPSS version 22 (IBM Corp., Armonk, N.Y., USA). Descriptive analyses were calculated for the category of practitioner, type of prosthesis, type of tooth, location, type and degree of damage to adjacent tooth. Chi-square test was used to assess the association between the experience of practitioner and degree of damage to adjacent tooth. It was also used to determine the association between location of tooth and degree of damage to adjacent tooth. Interexaminer reliability was assessed using kappa statistics. Level of confidence was kept at 99%. A total of 300 surfaces adjacent to the prepared teeth were assessed for iatrogenic damage which included equal number of teeth preparations by resident trainees and consultants. A high prevalence of damage to the proximal surface of adjacent teeth (78% on mesial tooth and 60.6% on distal tooth) was observed, with the majority (32.6%) belonging to the mild categories involving only abrasions as shown in [Table 1]. The incidence of damage was found to be a little higher (73.3%) in the consultant group as shown in [Figure 4]. Furthermore, statistically significant association was found between the experience of practitioner and damage of the surface mesial to the preparation [Table 2]. 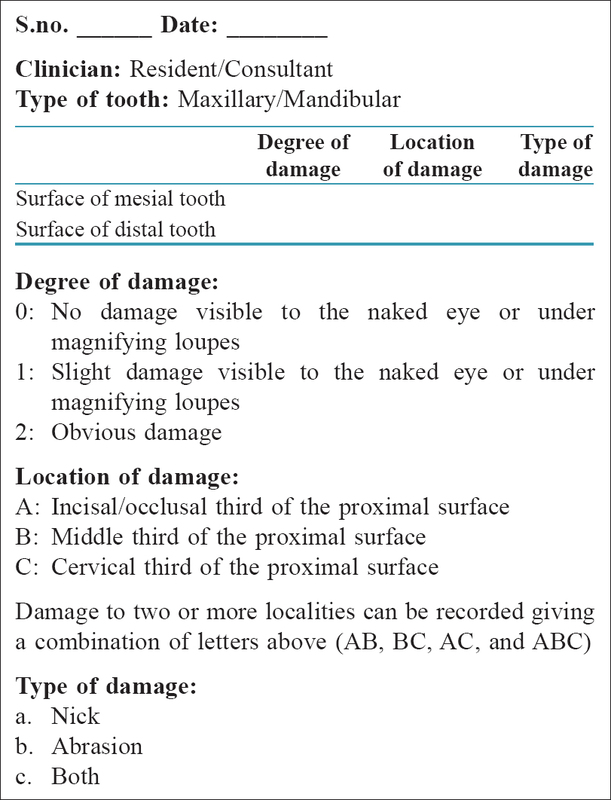 The significant association was found between location of tooth and site of tooth surface damage, with more severe damages occurring in mandibular teeth preparations as compared to maxillary teeth preparations as shown in [Table 3]. All the preparations were made by right-handed operators for metal-ceramic crowns and 57.5% of the iatrogenic damage involved the middle third of the tooth surface [Table 1]. The current study was carried out with the notion in mind to evaluate an important and often neglected aspect of restorative dentistry, and evaluation of the basic ethical concern that described the foremost obligation of a practitioner is to do no harm. With respect to restorative dentistry, mechanical preparation of a tooth either for crown or bridge preparation carried a high risk for damage to the adjacent teeth.,, The procedure if inadvertently performed could lead to the violation of the basic ethical concern that was doing no harm to the neighboring tooth during preparations. Currently, there are limited studies that taken into account this imperative subject. With this intention in mind, this study was conducted to evaluate the prevalence and extent of iatrogenic damage occurred during crown and bridge preparations. Moopnar and Faulker showed that 49.2% of the surfaces had obvious damage which is visible to the naked eye. Similar trend was shown in the current study, in which 20.6% of our observed surfaces were severely damaged. However, the prevalence of degree of damage in the current study was relatively lower. 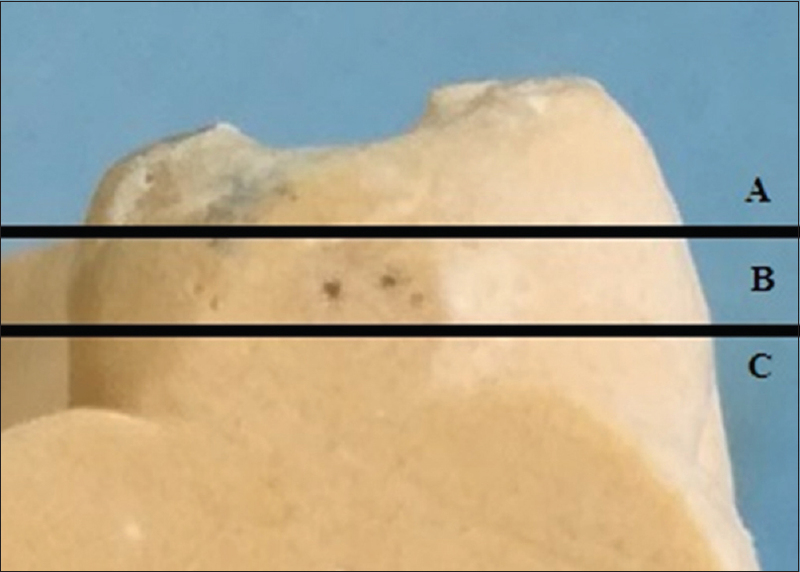 The pattern of location of damage was also distressing which shows that majority of damage occurred in multiple locations and mostly involving the middle third of the tooth crown surface either solely or in combination with other surfaces. This could be attributed to the presence of the most bulbous portion of the tooth that forms contact area at this location, and therefore, were the most susceptible area for the iatrogenic errors. If the operator had an easier access to the contact area, it could reduce the frequency of iatrogenic damage during the preparation of teeth. 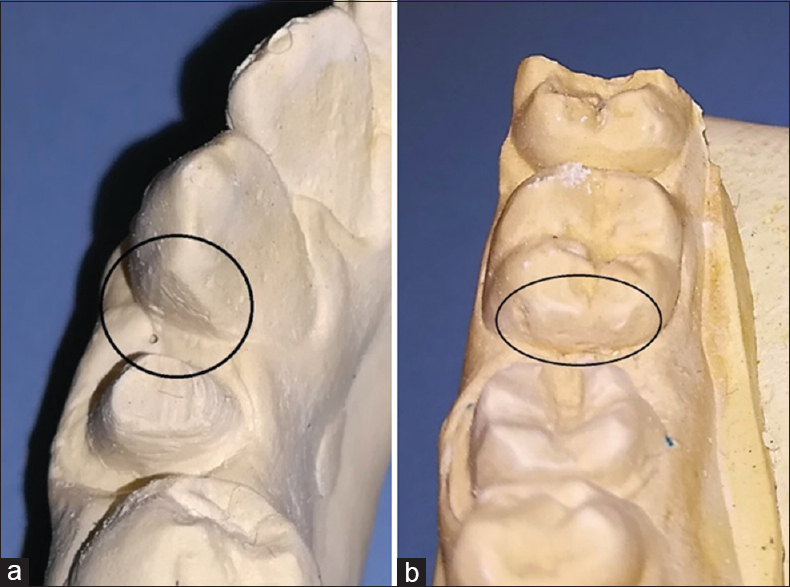 Moopnar and Faulkner also showed the similar trend of location of damage and reported that 65.7% of the damage was over multiple sites including occlusal, middle, and cervical third of the proximal tooth surface. Researchers had also attempted to find the association in the distribution of iatrogenic damage and dominant hand of operator. Mederios and Seddon did not find any significant difference between the right- and left-handed operator in term of distribution of damage. Similar findings had been showed by Abdulwahhab et al. ; however, Moopnar and Faulkner described that distal surfaces on the right side of mandible are more prone to get damaged by the right-handed clinicians. Canakci et al. moved a step further and concluded that the right-handed operators while treating periodontal disease were more successful in the right-sided dental chairs. We had not looked for this association because all of our operators were right-handed clinicians. Moopnar and Faulkner did not find significant difference among different clinician groups for the incidence of surface damage to the adjacent teeth during crown preparation. In contrast to this, Medeiros and Seddon while evaluating damage to the adjacent teeth during preparation of Class 2 cavity stated that undergraduate students were more cautious and careful while preparing Class 2 cavities and showed damage to only 23% of cases as compared to qualified operators who exhibited damage to adjacent tooth in 64% of cases. However, the current study did not show any significant difference in the frequency of iatrogenic damage on surfaces distal to prepared tooth and clinicians' experience. In addition to this, damage of surfaces mesial to the prepared tooth was found to be significantly associated with the experience of practitioner with higher iatrogenic damage by the consultants. Zachrisson et al. conducted a study in which they evaluated participants having proximal stripping done for orthodontic purpose and compared them with the controls for the incidence of dental caries. The results, however, showed no difference between the groups for the incidence of dental caries and concluded that properly done interproximal enamel reduction did not result in iatrogenic damage. In contrast to this, Radlanski et al. showed that even with the use of finest finishing strips, the indentations created with the use of coarse strips cannot be totally eliminated and the area beneath the indentation became susceptible for plaque accumulation. Within the limitation of the study, a high frequency of iatrogenic damage to the adjacent teeth had been found during crown and bridge work with the middle third of the tooth as the most susceptible site. However, the majority of damages were of milder type including only abrasions. I would like to thank Mr. Ali Shan, Library assistant, Aga Khan University, for helping in the literature search. Shillingburg HT, Sather DA, Wilson EL, Cain JR, Mitchell DL, Blanco LJ, et al. Fundamentals of fixed prosthodontics. Quintessence Publishing Company; 2012. Eliyas S, Jalili J, Martin N. Restoration of the root canal treated tooth. Br Dent J 2015;218:53-62. Abdulwahhab B, AlHati M, AlEnzi M, Babidan S. Assessment of iatrogenic damage to proximal surfaces of adjacent teeth following crown preparation by final year dental students in Saudi Arabia. Saudi J Oral Sci 2014;1:37. Medeiros VA, Seddon RP. Iatrogenic damage to approximal surfaces in contact with class II restorations. J Dent 2000;28:103-10. Lussi A, Gygax M. Iatrogenic damage to adjacent teeth during classical approximal box preparation. J Dent 1998;26:435-41. Arman A, Cehreli SB, Ozel E, Arhun N, Cetinşahin A, Soyman M, et al. Qualitative and quantitative evaluation of enamel after various stripping methods. Am J Orthod Dentofacial Orthop 2006;130:131.e7-14. Zachrisson BU, Minster L, Ogaard B, Birkhed D. Dental health assessed after interproximal enamel reduction: Caries risk in posterior teeth. Am J Orthod Dentofacial Orthop 2011;139:90-8. Lapenaite E, Lopatiene K. Interproximal enamel reduction as a part of orthodontic treatment. Stomatologija 2014;16:19-24. Patcas R, Eliades T. Enamel alterations due to orthodontic treatment. Orthodontic Applications of Biomaterials: A Clinical Guide. Woodhead publishing; 2016. p. 221. Moopnar M, Faulkner KD. Accidental damage to teeth adjacent to crown-prepared abutment teeth. Aust Dent J 1991;36:136-40. Walsh LJ. Minimal intervention management of the older patient. Br Dent J 2017;223:151-61. Long TD, Smith BG. The effect of contact area morphology on operative dental procedures. J Oral Rehabil 1988;15:593-8. Milic T, George R, Walsh LJ. Evaluation and prevention of enamel surface damage during dental restorative procedures. Aust Dent J 2015;60:301-8. Lussi A, Kronenberg O, Megert B. The effect of magnification on the iatrogenic damage to adjacent tooth surfaces during class II preparation. J Dent 2003;31:291-6. Agarwal E, Masamatti SS, Kumar A. Escalating role of piezosurgery in dental therapeutics. J Clin Diagn Res 2014;8:ZE08-11. 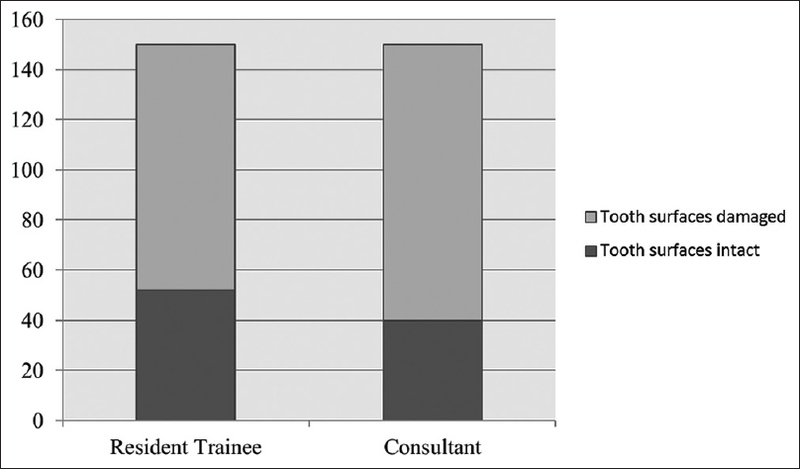 Canakci V, Tan U, Orbak R, Tezel A. Right- and left-handed dentists in periodontal therapy. Int J Neurosci 2002;112:1-4. Zachrisson BU, Nyøygaard L, Mobarak K. Dental health assessed more than 10 years after interproximal enamel reduction of mandibular anterior teeth. Am J Orthod Dentofacial Orthop 2007;131:162-9. Radlanski RJ, Jäger A, Schwestka R, Bertzbach F. Plaque accumulations caused by interdental stripping. Am J Orthod Dentofacial Orthop 1988;94:416-20. Piacentini C, Sfondrini G. A scanning electron microscopy comparison of enamel polishing methods after air-rotor stripping. Am J Orthod Dentofacial Orthop 1996;109:57-63.